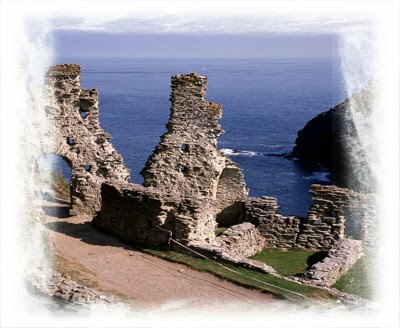 Geoffrey of Monmouth, the twelfth century author of “The Kings of Britain”, wrote convincingly of the conception (and birth) of Arthur by Uther Pendragon and Ygerna, wife of Gorlois, the Duke of Cornwall, at Tintagel Castle. Merlin, the magician, aided Uther by changing his appearance to that of the absent husband Gorlois. Gorlois was at battle to the north of St Austell, at St Dennis, where he was eventually killed leaving Uther free to marry Ygerna and proclaim Arthur their rightful son and heir to the throne. "Arthur , Lancelot and Gawain came into a very different land, scarce inhabited of any folk, and found a little castle in a combe. They came thitherward and saw that the enclosure of the castle was fallen down into an abysm, so that none might approach it on that side, but it had a right fair gateway and a door tall and wide, whereby they entered. They beheld a chapel that was right fair and rich, and below was a great ancient hall. They saw a priest appear in the middle of the castle, bald and old, that had come from the chapel. 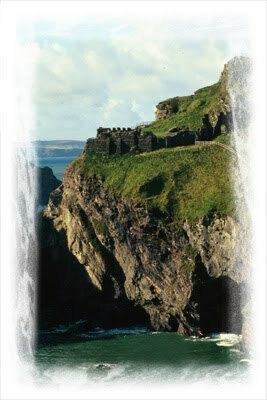 They are come thither and alighted and asked the priest what the castle was, and he told them it was the great Tintagel". During the 1930’s, Ralegh Radford’s excavation team found remnants of imported pottery used in the fifth century, which suggests the presence of a wealthy community on the headland adjacent to the island. In 1998, an inscribed slate stone was unearthed on the island, believed to date from the sixth century and have Latin markings which may refer to King Arthur. 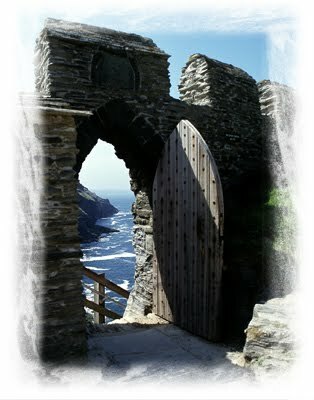 Fredrick Glassock, a millionaire, of "Monk & Glass" custard fame, was so smitten with all things Arthurian that he retired to Tintagel to form the "Fellowship of the Round Table", and to build, with over fifty varieties of local stone, "King Arthur's Great Halls" in the centre of Tintagel, opened on June 5th, 1933. It is a building worth viewing in its own right, not only for the Arthurian story it tells, but also as an example of the eccentricities of the British! King Arthur's Great Halls are open most days of the year. The stained glass windows of the Great Halls depict the Knights of Arthurian fame and their many deeds. The actor, Robert Powell, provides the voice of Merlin as he takes you on a journey through Arthurian times to the accompaniment of suitable musical, light and sound effects. This is both entertaining and informative. All photographs/images/graphics/maps/logos copyright to their relevant owners.